An update on new releases, adventures and events for The Cthulhu Hack, as I’m conscious things have been a little quiet. Key at the moment is work on a collection of three adventures with two other writers all themed around the same entity, taken from different angles and in very different settings. I sincerely hope that I will have this finished and published by mid-year, and it should be available in PDF and print. On the back-burner, but in development, I have the GM Screen and Character Creation Cards. I have prototypes for both and they’re undergoing tinkering to get them in a state suitable for wider distribution. I haven’t absolutely commited yet to the format of that distribution; these will both be available as PDFs, but the physical versions might well follow if I can find a cost-effective printer. In the background somewhere, I’m redrafting sections of the core book. This might be a v1.1 release or it could work itself into a v2. Only time will tell. I was driving toward a re-write for another connected project, but that has not been progressing as rapidly as I’d hoped. Next major event will be UK Games Expo at the beginning of June, when I’ll be running a couple of games, but focussing primarily in my role on the stall meeting you, the gaming public. This will be just over a year since launch and I have been very happy with the uptake and reports back. I have appreciated all the feedback and the many reviews. 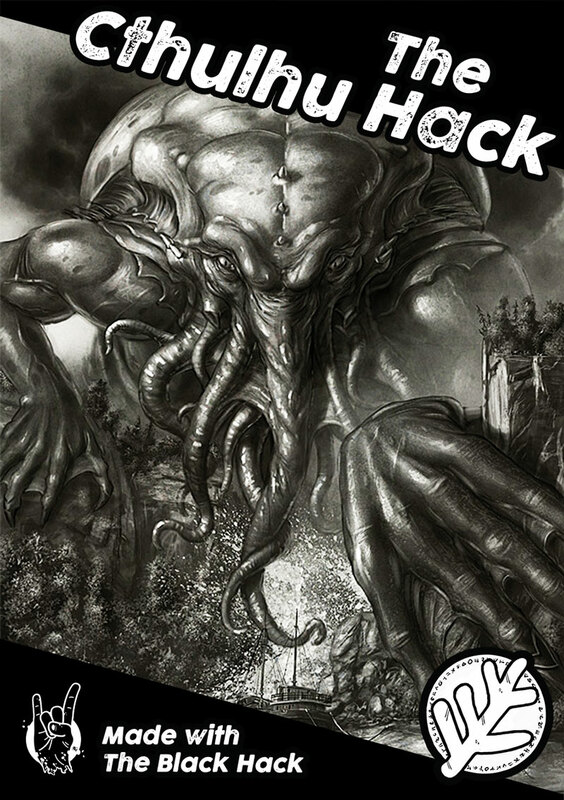 I will be tagging along with All Rolled Up to Gen Con 50, later this year, where I’ll spend Thursday afternoon running short sessions of The Cthulhu Hack. I also hope to run other games, spend some time on our stall, and maybe get a chance to wander around! On a podcast front, I had a discussion with Paul of Cthulhu from the Cthulhu Breakfast Club at AireCon. Last week, I recorded a long chat that will be available soon, with sub-titles, in connection with Netcon, a Spanish virtual convention, where a box set is up as part of a whole collection of prizes under the All Rolled Up banner. In unrelated news, I’m spending much of April writing twenty-six articles on Swedish-spawned dark fantasy role-playing game Symbaroum over on The Iron Pact, as part of the A-to-Z Challenge. While a bit of a distraction, my theme has been to add an element of Mythos and horror to the game – so, it should get me in the mood for more writing on The Cthulhu Hack.